To –ing or not to –ing……that is today’s question! One of my students asked me last month why we use the –ing form for blogging, networking, computing…..Good question! My answer? Because technology is constantly changing and plus usually these actions are constant, happen often, plus they are amusing but can be annoying – so we use the present continuous form…. On Wednesday 18 January, #ELTchatters wished each other a Happy New Year and got their teeth into a very stimulating chat. As language teachers, do we find these social networking platforms and services amusing or annoying??? Our students are already using a wide-range of social network sites and teachers are beginning to familiarize themselves with such sites, to keep up with technology but more importantly, to discuss and exchange ideas and develop as teachers. We read and write blogs, visit forums, develop Nings and Wikis, all of which are constantly changing and being updated. The #ELTchat itself is proof of this….it’s fast, furious, fun and educational! We have joined ther World of Technology, for good or for bad? By the way, did you know that if Facebook was a country, it would be the third largest country in the world???!!! So in the ELT world, here are the main themes from the discussion. There will be more pro chatters tonight as most members are keen SN users. #ELTCHAT is one of the major advantages of SNs for teachers. SNs have radically changed teachers’ lives. We will never feel alone again. Facebook has become a professionally developing site rather than just a social network. SN has revolutionized the way we think and opened wider perspectives. SNs are global and 24/7. SNs should be harnessed by 21 century teachers with enthusiasm. Use Facebook for personal contacts and Google+ for PD. SNs are an extension of staffroom chats with links, banter and discussions. ‘Virtual staffroom”. #ELTchat is great as it is an ‘outer of class collaboration’ discussion, as few teachers in the workplace know how to collaborate. SNs create friends which lead to face to face meetings. Share worksheets/mind maps for students, time-saving. Twitter tags can inform parents’ of students’ progress. Non-native teachers are also exposed to real language in the modern world. SNs, like Twitter and #ELTchat are energizing! Plus, through #ElTchat, you find more people to follow! So, start following!!! Some teachers find SNs too daunting to tackle. SNs can become addictive. They can take over your life, leaving little time for family and friends. Knowing when to stop is crucial – try to switch off! Replication of themes from one SN to another is annoying. Students become obsessed in finding their teachers on FB and intrude in teachers’private lives. Privacy issues with FB AND Twitter – do not accept people you don’t know or protected accounts on Twitter. Tweetdeck often has technical problems. http://www.collaborizeclassroom.com/ is a free online collaborative education platform that allows students and teachers to transcend the boundaries of their physical classroom to engage in an online collaborative learning environment. http://bloggerindraft.blogspot.com/2011/08/introducing-google-scribe-in-blogger.html-an aid to write your blog! http://www.scoop.it/t/interactive-teaching-and-learningExploration of engaging learning spaces and technologies that support them. http://www.diigo.com/ To collect, highlight and remember those bookmarks! @esolcourses: Best method for organizing #ELTchat bookmarks! Choose one and demo! 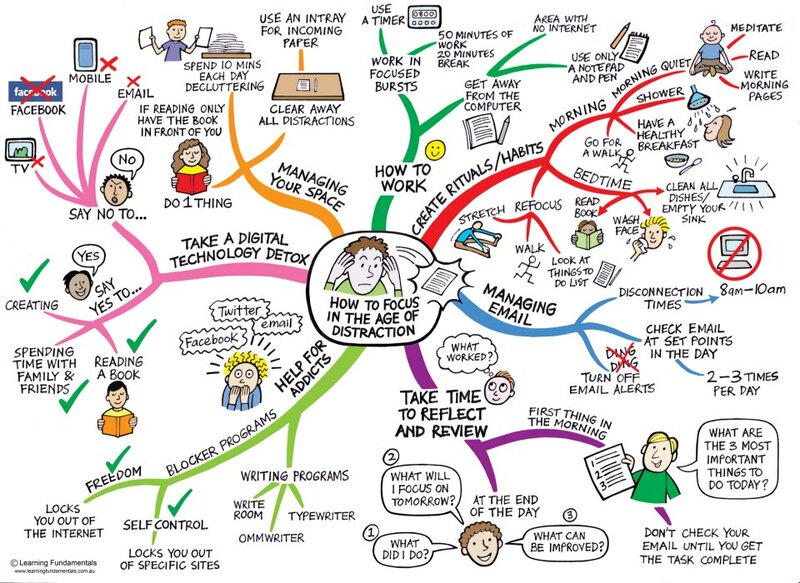 http://learningfundamentals.com.au/wp-content/uploads/Focus.jpg How to focus in times of distraction. Excellent mind map presentation! All you need to know about SN s and your students. http://educationland.wordpress.com/my-worksheets/http://educationland.wordpress.com/worksheets/http:/www.facebook.com/pages/Education-Land/221436857914023http:/t.co/gzX8zGIR Share worksheet and ideas! That’s the summary folks! I would like to add that I didn’t mention specific names on the summary as so many people commented on this chat, so there is something from everyone!! Thanks for another energy-boosting, informative chat! This is a summary of the #ELTchat on 18th January 2012 at 21.00 P.M. GMT and was contributed by Sharon Noseley @shaznosel on Twitter – originally posted here, it is reproduced on our blog with her kind permission. Many thanks, Sharon! Sharon Noseley has been teaching English to all ages and levels for the past 15 years in Greece and the UK. She currently works in a school in a village close to Athens and starts her day with a Pre –junior class and ends the day with Business English – such is the variety of life! She believes no matter what the age or level – motivation and dedication to the teaching profession are essential ingredients to language acquisition. Sharon has attended the Cambridge DELTA course at CELT Athens and has completed her Module 2 assessment. She has taught multi-cultural classes, on a voluntary basis, at CELT Athens and teaches Academic English at the DMU in Leicester, UK in the summer. She tries to keep up with technology and appreciates the support of her PLN through #ELTchat and on-line seminars and once she has finished with her DELTA Modules 1 & 3 work, would love to start a blog to help new teachers to get involved with Social Networking in order to develop and feel supported by someone who understands and can support them. Previous: Previous post: What would you like to talk about on #ELTchat on January 11? What a wonderful summary of what I guess was a great ELT Chat discussion. Unfortunately, I missed this discussion but I see there were a range of issues highlighted. It is interesting to see various teaching organisations as well as publishers starting to dip their toes in the social networking scene. However, I do find it imposing by major publishers or organisations to try to market or sell their services directly through the use of Twitter, writing a self-created blog or network (which could be perceived as artificial and they only want your money at the end of the day through the use of annual subscription), or promoting their services through a third party. However, the major advantage is that teachers are no longer constrained by the physical location of the school and can connect and feel part of network (as was highlighted above) but can also be rather overwhelming. Teachers need to continuously monitor, contribute and assist so that development is present. It is going to be an interesting year with developments in technology and I the IATEFL Conference is going to be great to learn more about potential software to enhance and develop PLNs. You want to start -ing right away by this beautifully written and laid-out summary! Well done, Shaz! !